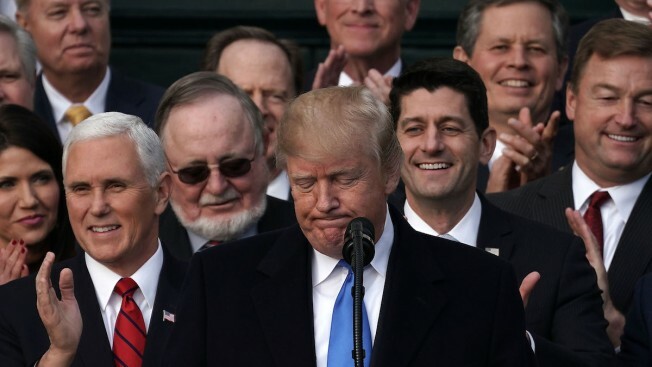 President Donald Trump pauses as Vice President Mike Pence (2nd L), Speaker of the House Rep. Paul Ryan (R-WI) (2nd R) and other Republican members of the House and Senate look on during an event to celebrate Congress passing the Tax Cuts and Jobs Act at the South Lawn of the White House December 20, 2017 in Washington, DC. About twice as many of the largest U.S. companies reported they didn’t owe taxes in 2018 compared with previous years, a partial result of the 2017 Trump tax law, according to a report. As taxpayers scramble to make last-minute payments due to the Internal Revenue Service, many of the country's largest publicly-held corporations are doing better: They've reported they owe absolutely nothing on the billions of dollars in profits they earned last year. At least 60 companies reported that their 2018 federal tax rates amounted to effectively zero, or even less than zero, on income earned on U.S. operations, according to an analysis released Thursday by the Washington, D.C.-based think tank, the Institute on Taxation and Economic Policy, NBC News reported. Companies like Amazon, Delta, General Motors and Chevron were "able to zero out their federal income taxes on $79 billion in U.S. pretax income," according to the ITEP report. "Instead of paying $16.4 billion in taxes, as the new 21 percent corporate tax rate requires, these companies enjoyed a net corporate tax rebate of $4.3 billion, blowing a $20.7 billion hole in the federal budget last year."